Founding KISS guitarist and Rock And Roll Hall Of Fame inductee Ace Frehley has released a new song today called “Rockin’ With The Boys”. 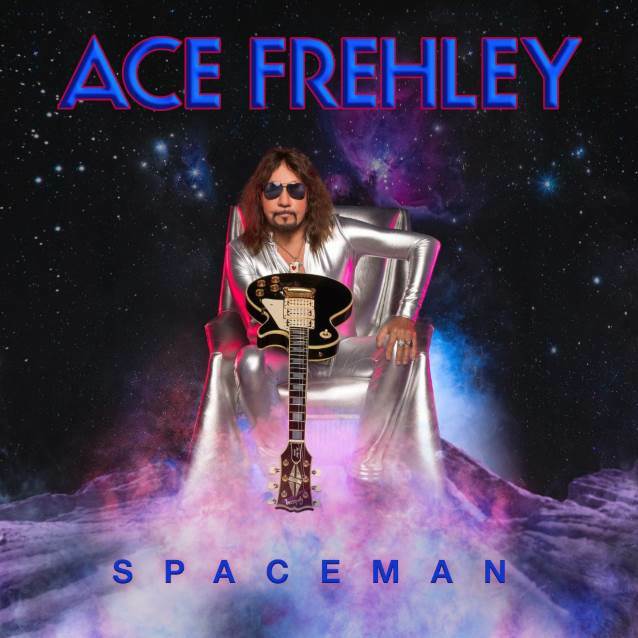 This is the second song Frehley has made available from his forthcoming all-new “Spaceman” album, due October 19 via Entertainment One (eOne). Frehley previously released the track “Bronx Boy” in April. “Spaceman”, Frehley‘s eighth solo LP, features nine new original tracks, including a cover of Eddie Money‘s “I Wanna Go Back”, a ripping power pop makeover of the original. “No need to worry, I’ll be home soon, ’cause I’m rockin’ with the boys,” Frehley sings on “Rockin’ With the Boys”, which tells the tales of life on the road. Ace says he wrote the original version of the song back in KISS‘s heyday in the ’70s. Both “Rockin With The Boys” and “Bronx Boys” are available on all streaming platforms today, and are iTunes instant-grat tracks for fans who preorder the album. In addition to Ace‘s distinctive guitar sound on each track, Ace played bass on all of the songs on “Spaceman” except for two. The listener might recognize the mighty dinosaur growl of a bass tone belonging to Gene Simmons on the album opener, “Without You I’m Nothing”, which Gene also co-wrote, and “Your Wish Is My Command”. Both songs were recorded at Frehley‘s home studio in Rancho Santa Fe, California. Ace‘s reconnection with Simmons and fellow KISS vocalist-guitarist Paul Stanley (who joined Ace on a cover of FREE‘s “Fire And Water” for 2016’s covers LP “Origins, Vol. 1”) might be chalked up to the fact that Frehley has been sober for more than a decade (he celebrates 12 years of sobriety in September). Ace‘s clean living no doubt has a lot to do with his productive streak, which began with the release of his top 20 “Anomaly” album in 2009. “Spaceman” (a title suggested by Simmons himself) serves as the first collection of all new Frehley-penned material since 2014’s “Space Invader”, which debuted at No. 9 on the Top 200 chart. The LP scored the highest=charting position of any former or current KISS bandmember ever and marked Frehley‘s first return to the Top 10 since KISS‘s 1998 “Psycho Circus” reunion album. Widely known as the original “Space Ace” and founding guitarist for 16 cumulative years (over two tenures) of the multi-platinum selling rock band KISS, Frehley is arguably the most popular original member. In addition to having the best-selling solo album career (vintage or current) among the original foursome, Frehley‘s self-titled “Ace Frehley”, released in 1978, went on to sell over one million copies, producing the only Top 40 single, “New York Groove”, from any of the legendary KISS solo albums (peaking at #13).